The West Cape Estates 33993 is a single family home community situated on 19 acres of land and surrounded by miles of natural wildlife preserve. This exclusive gated community offers a private enclave of only 28 residences. 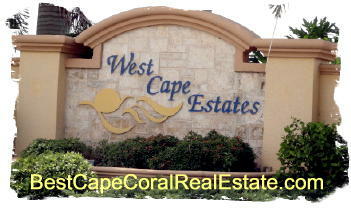 West Cape Estates, Cape Coral, Florida is a Beautiful Tropical Luxury community. nestled among the palm trees. If you need more information about West Cape Estate homes or other Cape Coral Real Estate, feel free to Contact Shellstar Realty. Our Realtors have many years experience and can help you obtain the best price on your real estate purchase! West Cape Estates, Cape Coral Real Estate Easy to use and Up to Date MLS search!